The Lilly Family School of Philanthropy community was saddened to learn that Dr. Russell G. “Russ” Mawby, our former Board of Visitors member who was Chairman Emeritus and former President and CEO of the W.K. Kellogg Foundation, passed away on October 20 at the age of 89. Dr. Mawby initiated and supported a wide range of innovative ideas that continue to shape many aspects of our field and of our school. During his tenure at the Kellogg Foundation, he earned a global reputation as a thoughtful and visionary leader in effective philanthropy. Under his leadership, the foundation established philanthropy and volunteerism as a major focus in its grant making, one of the first foundations to do so, and created the Kellogg National Fellowship Program. A tribute from the Kellogg Foundation further describes his national impact, noting, “He was active in efforts to make philanthropy and volunteerism a recognized academic discipline. [And] he oversaw the pioneering development of high quality, standards-based educational materials on philanthropy and volunteerism for K-12 students, primarily through the Learning to Give program, which is now the leading learning portal for philanthropy education in the world.” Our school was privileged to play a role in the Learning to Give initiative. Our Founding Dean Emeritus Gene Tempel reminds us that Dr. Mawby has always been a strong supporter of the development of university programs related to philanthropy. 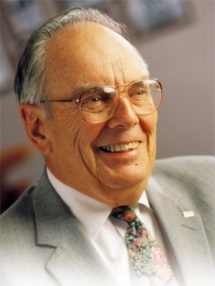 Through his leadership of the Kellogg Foundation, Dr. Mawby was one of the original funders of our school’s predecessor, the Indiana University Center on Philanthropy, investing the foundation’s grants in the fledgling initiative at a time when formal study of philanthropy as a discipline was all but unheard of. He provided advice and good counsel to many leaders of our enterprise. We honored Russ and Lou Ann with the IUPUI Spirit of Philanthropy Award and at our recommendation, Indiana University presented him with an honorary degree. I am pleased to have had the opportunity to meet him. Dr. Mawby believed in our school and the student experience it provides, and was a generous donor in support of our work and our students. He and his wife Lou Ann endowed five Russell G. and Lou Ann Mawby RISE Scholarships to prepare students to work in the nonprofit sector and help guide philanthropy’s future. We are grateful for Dr. Mawby’s unswerving commitment to advancing philanthropy education and for all he and Lou Ann have done for our school, which will long be remembered.